Description	 MS in Latin and Eastern Upper German on paper, Bayern-Salzburg, 2nd half of 15th c or early 16th c, 8 pp, 11x18 cm, single column (11x16 cm) 23 lines in an angular German Gothic cursive and 16 5-line staves with polyphonic music in mensural notation. Fols. 1v and 2r contain complimentary parts of the opening section of a Credo setting. All the 5 pp with the Credo seem to come from a single setting. The two recto parts present the beginning and middle of a Discantus part, the two versos the beginning and end of a Tenor part. 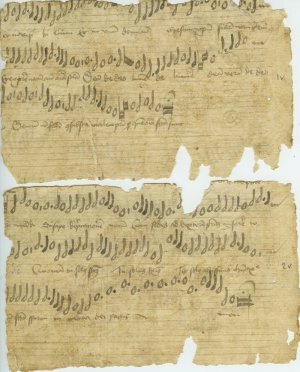 The earliest witness to European polyphony is as early as the beginning of 10c notated in Palaeofrankish neumes (BL MS Harley 3019). 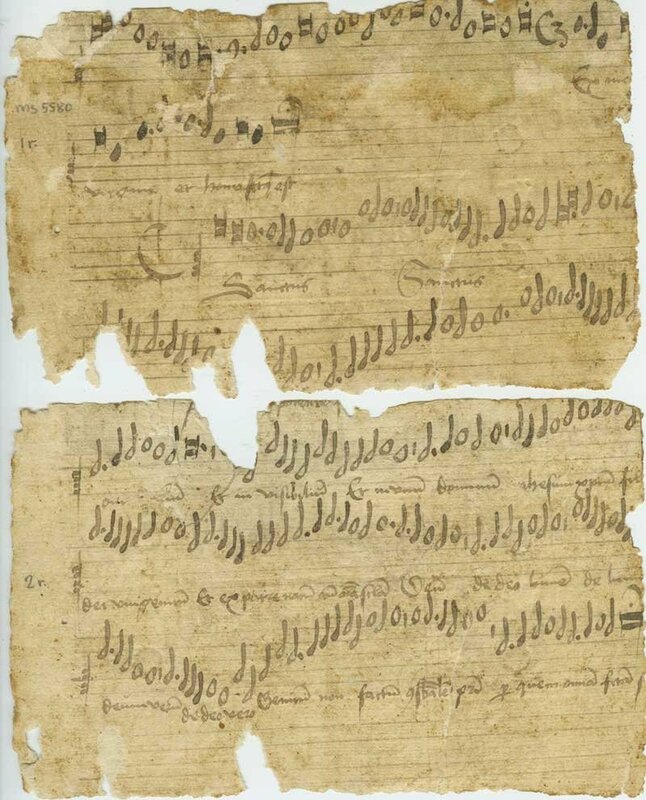 Compare the palimpsest Schøyen Collection MS 5284/1, which has Palaeo-Frankish notation from 11th c rearranged as polyphonic setting in 14c. Provenance	 Bloomsbury Auctions 7th December 2016, lot 25. Identification of the texts kindly made by Dr. Jeffrey J. Dean, and of the language and location by Professor Nigel F. Palmer. Text 2 In dulci jubilo is attributed to the German Dominican, author and mystic Heirich Seuse (1296-1366): Das Büchlein der Wahrheit, written ca 1328-1330. The oldest MS is Codex 1305, Leipzig University library from ca 1400. It was first printed in Joseph Klug: Geistliche Lieder 1533. Martin Luther possibly added another verse in 1545. Michael Praetorius made several settings of it. J. S. Bach also made several settings, as a chorale BWV 368, as a double canon in Orgelbüchlein BWV 608, and also used the opening of the theme in the choral preludes BWV 703 and 704. 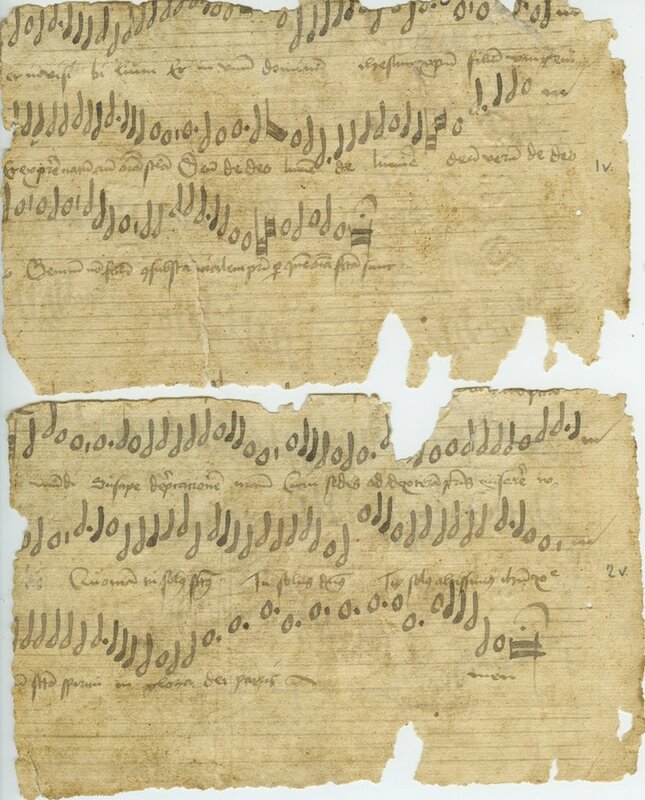 Text 3 Puer natus in Bethlehem (A child is born in Bethlehem) goes back to 13th c and was also used by J. S. Bach in his Orgelbüchlein BWV 608. Text 4 Puer nobis nascitur (Unto us is born a Son) is first known in the German Moosburg Gradual from 1360 (München, UB folio 156), which is based on 12th and 13th c. organum music from Notre Dame de Paris and the Benedictine Abbey of St. Martial, Limoges (See MS 658, Antiphonal from St Martial ca 1030). Text 5 Dies est laetitiae (Noël, Noël, this is the joyful day), motet for Christmas day goes back to 13th-14th c.